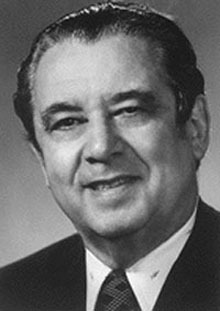 American chemist Herbert C. Brown studied aromatic substitution, molecular addition compounds, the reacceptance of steric effects, and the relation of borohydrides and diborane in organic synthesis. In collaboration with his son, chemist Charles A. Brown, he devised what is now called the simplified Brown procedure for laboratory-scale hydrogenations. In 1956 he discovered that unsaturated organic molecules can be easily converted to organoboranes through hydroboration reactions, adding boron and hydrogen to multiple bonds, which led to the development of dozens of combinations of boron and hydrogen that have been used in manufacturing medicines and other organic compounds. The practical impact of his work was to greatly reduce the amount of time necessary to synthesize new compounds for testing as potential pharmaceuticals. He shared the Nobel Prize for Chemistry in 1979, and he is the namesake and was the first recipient of the American Chemical Society's Herbert C. Brown Award, in 1998. He said that he was first drawn to chemistry by the gift of a book on the topic from his girlfriend, a chemist who later became his wife. His last name was Anglicized to Brown as his family immigrated to America in 1914; he was born Herbert Charles Brovarnik.